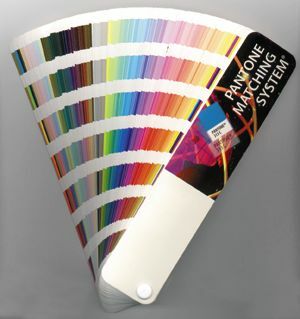 The Pantone Matching System® is the industry standard for selecting, matching, and mixing color. The Pantone System utilizes 11 basic colors to achieve over 1000 different colors that are used by printers and art departments. The basic colors that are used are yellow, warm red, rubine red, rhodamine red, purple, violet, reflex blue, process blue, green, black, and transparent white, which looks clear. The Pantone Matching System® Color Guide is an indispensable tool for printers and designers. The guide provides swatches for all of the colors that can be attained using the Pantone System. Included in the guide are the 11 basic colors which are in the front of the book, followed by the process colors used in 4 color process printing, then the hundreds of colors that can be mixed from the basics, and finally the fluorescent and metallic colors. Each of the mixed colors are assigned a PMS number. The first number assigned for a mixed color is 100 and the numbering proceeds up from that point. The instructions for mixing the color are listed below the color swatch. The mixing instructions show the number of parts for each of the basic colors that are necessary to mix a particular color, as well as a percentage of the total volume for each of the colors that are required. For example, to achieve the color Pantone 198 (which is a red color), the mixing instructions are listed as follows: 6 parts (37.5%) Rubine Red, 2 parts (12.5%) Yellow, and 8 parts (50%) Transparent White. By using the various ink formulas found in the swatch book, ink manufactures and printers can mix colors to exact specifications. Pantone also issues a digital color guide for electronic publishing which lists the color formulas in a format necessary for the colors to be displayed on a computer screen. Note: Any Pantone Color Guide should be replaced after a year, because the printed colors in the swatch book will shift or fade and no longer be a true representation of the actual colors.